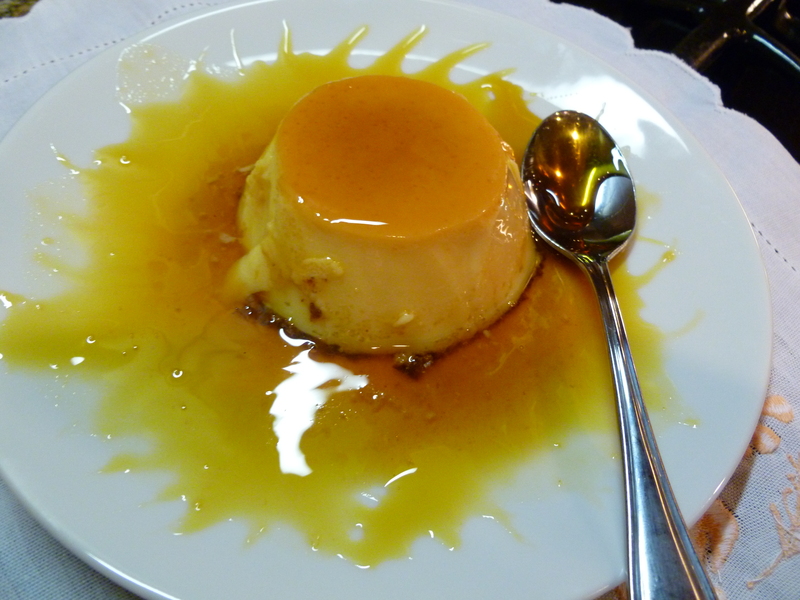 Brazilian Flan or what we like to call “Pudin de Leite” is a very popular dessert all over Brazil. It is also popular in many Latin American countries. There are several ways to make a Flan, this recipe is the way most Brazilians do, it is easy and absolutely delicious. 1) Pre- heat oven to 350F. Boil 7 cups of water ( save 1/3 cup for caramel sauce) and pour into a large rectangular Pyrex dish about 9.5×13.5 inches. 2) Add condensed milk, milk, vanilla and eggs to a blender or food processor and beat really well. 3) Heat sugar in a sauce pan stirring constantly until sugar is melted and brown in color, reduce heat to low and add 1/3 cup hot water, it will sizzle but keep stirring with a wooden spoon until it melts again into a syrup like consistence. 4) Glaze 5 small Pyrex bowls about 175ml with a little bit of the hot caramel sauce and set bowls inside the dish with hot water. Pour blended milk and eggs into the bowls. Place them on oven for about 40 minutes. Insert a fork in the center, if it comes out clean it is ready. Remove from oven, remove bowls from hot water and set them aside to cool over the counter. cover the bowls with a plastic wrap and place them in refrigerator overnight. Pour remaining caramel sauce in a glass measuring cup, cover with plastic wrap and store it in refrigerator as well. 5) When ready to serve Flan, remove plastic wrap, pass a butter knife around the edges of the bowl to loosen the sides of Flan. Turn bowl upside down over a desert plate and shake Flan a little, flan will loose into the plate. Heat the sauce that is left in the bowl in microwave for 10 seconds and pour over Flan. Heat the remainder of caramel sauce that is in measuring cup in microwave for 15 seconds and drizzle extra caramel over the Flan.. Enjoy!